America's Army 2.0 Game Review - Download and Play Free Version! Outstanding graphics and audio quality. A remarkably authentic and compelling team-based game. In Boot Camp you learn the ins and outs of the game while unlocking upgrades. Unique mechanics encourage a whole new tactical play style. Huge variety of maps that allow for flexible strategies. Depicts incredibly realistic combat situations. No campaign mode, just training and multiplayer. Retrying objectives makes you listen to the mission's objectives without having the option to skip. The player community is awfully small. It can take a while to get used to. Listen up, maggot, because you’re only going to hear this once. You’ve just enlisted into the United States Army and everyone knows exactly what you’re thinking. You think you’re going to go out into the field, gun down every crazed terrorist in sight, and come back home with a medal in hand. Think again; that is not how the Army works. You are expected to use standard-issue army equipment. You are expected to work closely with your buddies and follow instructions. You are expected to identify your targets before you fire. Most of all, you are expected to not act like an invincible hero. There are no re-spawns, extra lives or power-ups to find here; when you die in this game, you are out of the round forever! If you don’t think you can handle that, then go try one of the hundreds of other shooters on the market. Combat in America’s Army 2.0, also known as Special Forces, is as real as it gets! Forget everything you have learned in previous first-person shooters. Don’t think for a second that your old tricks are going to work here; there is no circle-strafing, rocket-jumping, spy-checking, bunny-hopping, or any of that other nonsense. America’s Army: Special Forces does not aim to give you constant slam-bang action. It’s here to deliver the most authentic combat simulation that your computer can handle. Friendly fire is always on. Check your targets and take special care to avoid shooting your teammates. Death is permanent. There is no re-spawning; if you die, you’re out until the next game begins. It takes only a few hits for either you or your enemies to die. Be quick or be dead! Fire from three positions: on two feet, while crouched, or while lying prone on your stomach. Aim your gun freely or look down the iron sights for better accuracy. Switch between multiple firing modes, including single, burst and automatic. Firing modes vary from weapon to weapon. Learn to run, crawl, hurdle and climb over and past obstacles. Guns can jam if treated irresponsibly. Don’t get caught with a disabled weapon in the open; fix it fast! Train as if Your Life Depended On It! The Army takes care of its own and won’t send any of its boys to battle while they’re still green. Before you can officially begin your career as a soldier, you must do what everyone who has come before you has done: complete boot camp. You may be a completely clueless whelp when you start out, but once you finish, you will be broken down and rebuilt as a living weapon capable of fighting the way all proper soldiers in America’s Army must fight. Complete over a dozen training exercises to learn the ropes of America’s Army. Learn all about proper marksmanship on the shooting ranges, movement in the obstacle courses, field medication and more. Heed the words of your drill instructors. Familiarize yourself with standard-issue Army equipment, including the M-67 hand grenade, the M-203 grenade launcher, the M-249 rifle, and more. Educate yourself about proper Army protocol to see how soldiers train and are expected to act in the field in real life. Complete the more challenging training exercises to unlock even more advanced missions online. A soldier’s life is never easy. Just like in real life, America’s Army 2.0 will expect you to fight in all sorts of places and with any number of situations that cannot be covered with training alone. All the while, you must also do as the Army does and abide to its seven core values: loyalty, duty, respect, selfless courage, honor, integrity and personal courage. A soldier is nothing if he has none of these things. Fight on over 60 enormous maps that take place in a huge variety of settings, including remote villages, urban war zones, collapsed tunnels, insurgent camps, and more. Assume your choice of role for each individual game you take part in. Play as a rifleman, marksman, grenadier, medic and so on. Use cover, find strategic spots to attack from, and set up traps and ambushes with your team. Make your life easier by using a number of useful tools like binoculars to see what lies ahead, bipods to mount your guns on, night vision goggles to see in the dark, and more. Sometimes, you might be expected to make the ultimate sacrifice so that the rest of your team can survive and succeed. Jump on a thrown grenade to absorb the explosion and save your brothers-in arms! Disorient enemies with flashbang and smoke grenades. Follow the Rules of Engagement to the letter. Avoid civilian casualties, abstain from damaging the surrounding infrastructure if you can, and do not inflict bodily harm on your fellow soldiers. Training does not end once you graduate from boot camp. In many ways, it will continue on for the rest of your life. Your progress will be recorded as you play America’s Army 2.0, giving you and all other players an idea of how good a soldier you are and how far you have progressed ever since you got started. Accumulate Honor points as you complete training exercises and online missions. Having a greater number of Honor points will open up new servers and missions for you. Upload your statistics online. See the total number of times you have killed, fallen and accomplished goals over the course of your career. With America’s Army 2.0, you can experience a fairly realistic military shooter. Since it is backed, funded and developed by the United States Army itself, it is likely as close to the real thing as you’re ever going to get outside of actual combat experience. By playing America’s Army: Special Forces, you will not only get one of the most tactical games the shooter genre has ever produced, but you’ll also surely get a deeper appreciation for what the U.S. Army truly stands for. Best of all, you can experience everything it has to offer for free without any strings attached! Get out there and be all that you can be! In America's Army: Special Forces, players attempt to earn Green Beret status by completing individual and collective training missions drawn from the Special Forces Assignment and Selection (SFAS) process. Players who complete the SFAS process have the opportunity to take on elite Special Forces roles and are qualified to play in multiplayer missions with units ranging from the elite 82d Airborne Division to the 75th Ranger Regiment. Challenging Green Beret training - Complete training missions drawn from the SFAS process at Fort Bragg. Successfully complete SFAS and advance to Special Forces Qualification Course (Q-Course) missions to explore new Special Forces roles. Intense Special Forces action - Intense Special Forces action - Experience multiplayer missions in simulated combat combat environments. Take part in missions that span the capabilities of a Special Forces detachment, including unconventional warfare, direct action, surveillance and reconnaissance and Combat Search and Rescue. Detailed Special Forces equipment and military hardware - Building on the equipment available in America's Army: Operations, America's Army: Special Forces adds the M4 Carbine featuring the Picatinny rail mod system for attaching laser-aiming devices and sighting systems; the MP5SD6 Remington 870 shotgun for forced entry; the AT4, a shoulder-fired anti-tank rocket and the BDM, a shoulder-fired bunker demolition munition. Accurate Soldier behavior - Players are bound by the laws of land warfare, Army values (honor, duty and integrity) and realistic rules of engagement as they navigate challenges in teamwork-based multiplayer force vs. force operations. Mission accomplishment standings are evaluated based on team effort and adherence to a set of values and norms of conduct. When America’s Army was first released, nobody knew what to think. The very idea that the United States Army was developing its own in-house game seemed ludicrous. Many people doubted that they had the ability to pull it off. Others thought the whole thing was just rotten to its very core. Regardless of the controversy, it came out and many games and critics alike were ultimately stunned with the final result. America’s Army was deemed to be a neat little project and was indeed quite fun. By doing away with many popular first-person shooter conventions, it introduced a more realistic way that those games could be experienced. The end result was something that played much more differently than everything else in the crowded genre. Time passed and the project was given constant updates and bug fixes until it finally reached version 2.0. As the changes were becoming increasingly more radical and ambitious, this new version was treated as a sequel and dubbed America’s Army: Special Forces. 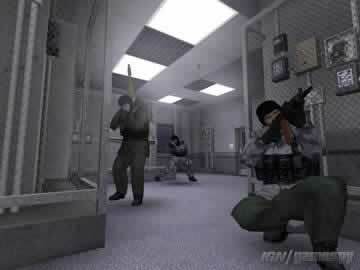 While it brought about many changes to the original game, it continues to be one of the most unique and tactical shooters you can find on the web to this very day. 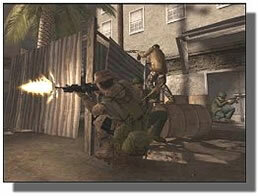 America’s Army: Special Forces aims to provide as realistic an experience as possible, right down to the graphics. They may not have the most stylish or distinct-looking visuals out there, but that was never the point in the first place. They get the job done, they are very detailed, and everything is animated adequately, even if the movement of the soldiers can seem pretty stiff and robotic. You just have to remember that the graphics are a product of their time. When the game was first released back in 2003, they definitely looked good, but they won’t hold a candle to any of the shooters that have come out since then. On the other hand, the sound design is second to none. America’s Army 2.0 eschews all forms of background music to deliver as immersive an experience as possible. The voice-acting of your fellow soldiers and drill instructors is clear and concise, but where the game really stands out is how well the sound effects have turned out. Whenever you fire a gun, you aren’t hearing any old stock sound effect; you’re hearing an actual recording of that weapon going off. The Army did not stint one bit on the audio front; every gunshot and explosion sounds off realistically from one side of the map to the other, gets muffled in a manner that is true to life, and echoes appropriately. It does a great job at putting you into the scene and can even be a bit chilling at times. No matter how good its sound is, where America’s Army 2.0 really stands out in is its gameplay. Just like everything else about the game, the United States Army went straight for the realism angle in terms of its combat. That means one bullet is more than enough to kill you, and it doesn’t need to hit your head to do that. Furthermore, you don’t re-spawn upon death; when you die, you’re out for the rest of the round. It may sound harsh, it may sound unforgiving, and it is. However, by shaking up these fundamental elements that we’ve grown so used to in more traditional FPSs like Counter-Strike, Team Fortress and Call of Duty, America’s Army 2.0 demands that you get into a different mindset entirely. It actually isn’t all that bad. You don’t ever want to work alone. You’re always going to want at least one buddy watching your back at all times. You don’t want to be hasty either. You need to move carefully, check your corners, and stay behind cover whenever you can. Firefights are often swift affairs. You have to learn to be especially fearful of explosives like the old M-67 hand grenade. If those babies don’t kill you and your fellow soldiers off in an instant, then they’ll likely force you to retreat to possibly less strategic positions. Your aim can be pretty wavy and only by going into more prone positions will you be able to shoot with any degree of accuracy. Running and gunning isn’t a very smart tactic and your gun can periodically jam. Friendly fire is also on at all times, so you can’t just fire willy-nilly at everything that moves. A soldier you see on the other side of a door could be one of your own guys and you have to be doubly careful with where you drop your explosives. More than anything else, you really don’t want to hunt your enemies down; it’s more often than not better to have them stumble into your perfect ambush. 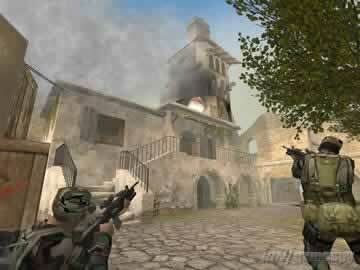 In short, Special Forces encourages strong tactical play, teamwork and spatial awareness more than any other FPS. Neither you nor your enemies can afford the risk of getting shot even once, for death could be around any corner. The action may be a little slow-paced, but the tension remains high at all times and it can be especially dramatic when it slowly dawns on you that you may very well be the last member of your team still standing. While the game might result with you sitting on the sidelines a lot, matches are intentionally designed to be short and sweet. Don’t despair too much if you die; another round should be ready in about five minutes at the most. 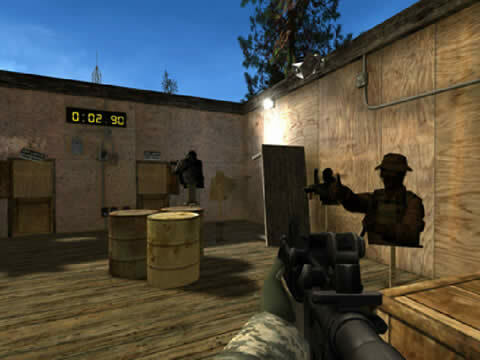 America’s Army is a multiplayer shooter with an emphasis on teamwork. Players are divided up into two teams that are pitted against each other. 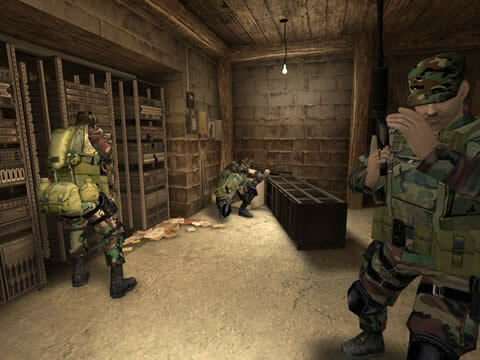 Interestingly, players always perceive themselves and their teammates as American soldiers and see their opponents as balaclava-wearing terrorists. True to the game’s focus on realism, the games and missions you play in are pretty grounded. There is no capture-the-flag, free-for-all, or king-of-the-hill to be found here. Most matches are more akin to your basic team deathmatch affairs, though there are also ones where one team has to do something more protracted, such as defending a certain point or escorting a VIP from one end of the map to the other. Never let it be said that the U.S. Army doesn’t know its level design. America’s Army 2.0 has by far some of the most impressive maps the genre has ever produced. They’re large, they’re expansive, they’re varied, and there are a lot of them. A city environment has buildings you can go into, cars you can duck behind, rooftops you can climb up on, and holes blown into the walls that you can shoot through. An interior location can be riddled with a maze of hallways, spiraling flights of stairs, rafters and pipes to hide in and snipe unassuming foes from, and ventilation shafts to sneakily crawl through. Maps can be open and spacious or tightly-packed and claustrophobic, they could take place in the daytime or in the darkness, and they can have a lot of vertical space. Whatever the shape the map is in, there are lots of places where you can attack and be attacked from. If the base mechanics of America’s Army are not enough to force you into fighting tactically, then the levels certainly will. You need to use every bit of the environment to your advantage. Variance doesn’t just end with the maps. 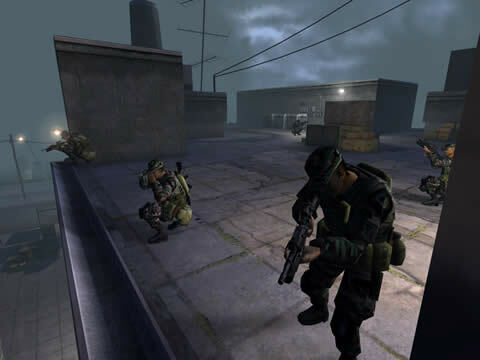 As the name of America’s Army: Special Forces indicates, players can also assume the roles of any class in the Army’s Special Forces. These include a medic who can heal non-fatal wounds in the field, a marksman who specializes in picking off targets from afar, a grenadier who comes equipped with a grenade launcher, and so on. Sadly, you can’t always play as the class you may like; each game has limitations and it’s always first come, first serve, but that once again highlights the fact that this is how the Army does things. Every team needs to cover a wide number of skills after all. Thankfully, you can customize your loadouts by determining what weapons, gear and accessories your avatar can come equipped with and the sheer variety of items is pretty astounding. Binoculars, night vision goggles, bipods, scopes and suppressors are all available and they all have a hand in changing your team’s overall strategy. Figuring out what things work best for you can be pretty fun. Perhaps the greatest innovation the America’s Army series has brought to the table is how it integrates Army protocol into the gameplay. Every player is sworn to adhere to the Rules of Engagement, or ROE. That means they have to avoid doing things like killing civilian NPCs, causing too much damage to the environment, or harming teammates. Violating the ROE too much in a single match can get you temporarily booted out of the server. Like most things in the game, it’s not very conventional, but it’s important for getting the Army’s point across and it forces you to watch where your shots go while you fight. It also helps keep people from excessively trolling the game and ruining the fun for everyone else. It’s one thing to die at the hands of your enemy. It’s another when some wise guy who’s supposed to be on your side blows you up for giggles. This will ensure that he won’t last long if he doesn’t behave. In a way, the greatest strength of America’s Army might also be its biggest weakness. The game’s unforgiving nature can make learning all of the ins and outs difficult to navigate. There are more actions you need to memorize and make use of from your average shooter, such as changing your stance, using the right battle command to communicate something important to your team, and so on. Most of all, you need to learn the importance of checking your targets and acting fast. A slow trigger finger will get you killed, but you won’t do yourself any favors if you kill your own buddies. The good news is that the game’s training mode, which is done in such a way to imitate boot camp, is there to walk you through all the base mechanics. You’ll learn how to switch between different firing modes, how to assume different combat positions, how to properly throw and “cook” grenades, how to run, hurdle, climb and crawl, and generally how to fight in enclosed spaces, among other things. The bad news is that training alone isn’t going to teach you how to be a good tactical soldier. To be fair, this is admittedly realistic like everything else in the game; basic training isn’t going to turn every green cadet into a Green Beret after all. It’s just that it can be a little disheartening to spend almost the entirety of your first few matches as a lifeless corpse. As for the training exercises themselves, they get the job done at walking you through all the basics. It’s especially creative and immersive how they also simulate the basic training experience. There will more often than not be at least one drill instructor barking instructions at you and it’s pretty cool how places like the shooting ranges feature other cadets hard at work shooting their targets. Unfortunately, despite these touches, the training exercises can also be pretty boring as well. Thankfully, since the game is no longer officially supported, you don’t necessarily have to complete them all if you don’t want to; you can just jump right into the multiplayer immediately. That wasn’t always the case. Back when America’s Army 2.0 was still new, completing the first four exercises was required to get into the meat of the game. Now that it’s played via the AA Assist client, they can be safely ignored, even if the first few exercises should at least be used to get your feet wet. Unfortunately, the game’s current state carries more severe issues. Ever since America’s Army 3.0 was released, official support for version 2.0 has more or less dropped and it’s now being carried by its old fans. The official servers are pretty much a thing of the past at this point and player-run servers are the only choice you have anymore. Worst of all, the once vibrant community is pretty much a shadow of its former self. There are still active servers to find on AA Assist, as well as plenty of people to play with, but it could be a matter of time before America’s Army: Special Forces dries up completely. In the end, America’s Army 2.0 may not be for everyone, but those who are willing to work within the confines of its rules will find a very rewarding experience. You most certainly can’t argue with the price either, since it’s completely free. Don’t let the fact that it’s largely a public relations tool for the U.S. Army color your predispositions of it either; it never goes for the hard sell approach. It won’t try to make you enlist, it won’t bombard you with annoying ads, you won’t get contacted by the Army unless you decide to contact them first, and you don’t need to send them any personal information if that’s a concern. It can simply be enjoyed as the tactical shooter that it is. If you can handle the fact that it’s a little past its prime and doesn’t have quite a large population anymore, it’s well worth a look for anyone looking for a way to revitalize the little first-person shooting gamer they have inside of them.